Boone County Family Resources (BCFR) is planning two affordable, energy-efficient apartment buildings for persons with disabilities in our community. The buildings, located on two sites in central and southern Columbia, will be universally designed with several fully accessible units. There will be 28 apartments created with 24 of them being one-bedroom apartments. With the current wait list for public housing and other affordable housing in the range of one to five years, BCFR saw a need to expand the availability of accessible, affordable housing for people with disabilities in our community. BCFR currently knows of 70 individuals and/or small families with a need for the planned housing. Adults with a disability who can live on their own with or without support and small families with a child who has a disability are among potential tenants. While community supportive services are available if needed, the apartments will not be a residential program providing daily or 24/7 care. BCFR has been working with architects to create building plans which will be visually compatible with, and complementary to, surrounding homes. Sidewalks, landscaping and planned green space around the buildings will also enhance the neighborhoods. Universal design features will allow for aging-in-place, also adding stability to the area. The site for the new building in central Columbia is on St. Joseph Street in the North Village neighborhood. 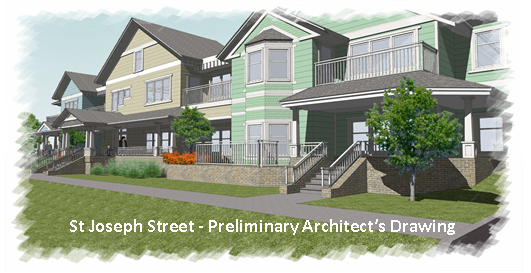 The façade of the new building will be designed to blend in with this historic neighborhood by having similar roof and porch lines of the nearby single-family homes. It will include 11 one-bedroom and 2 two-bedroom units. The site for the new building in southern Columbia is on Apple Tree Lane in the Cedar Lake subdivision. BCFR is planning to develop fifteen units including 13 one-bedroom and 2 two-bedroom apartments. Both buildings offer easy access to public transportation, employment opportunities and community amenities such as parks and restaurants. If Low Income Housing Tax Credits (LIHTC) are awarded to the project in December 2015, we anticipate construction beginning in Summer/Fall 2016 and occupancy in Summer/Fall 2017. Consistent with BCFR’s mission, the new apartments will enhance opportunities for people with developmental disabilities to thrive in their community, connect with others in their neighborhoods, and achieve goals for living in places they can call their own.